Hey Guys! Welcome you onboard. The above calculator is an instant Rankine to Fahrenheit Converter. You can put any value in Rankine temperature scale and get Fahrenheit value in return on the fly. You need to convert temperature from one scale to another based on the technical requirements of the project and the research you are working on. Converting temperature from one scale to another is just one click away, setting you free from the hassle of manually converting these values. Following formula is used to convert temperature from Rankine scale to Fahrenheit scale. The Fahrenheit temperature is equal to the Rankine temperature scale minus 459.67, terming that 0 °F is equal to 459.67 °R. Convert 50 Rankine temperature to Fahrenheit temperature. We can conclude from the equation above, 50 Rankine temperature is equal to -409.67 in Fahrenheit Scale. 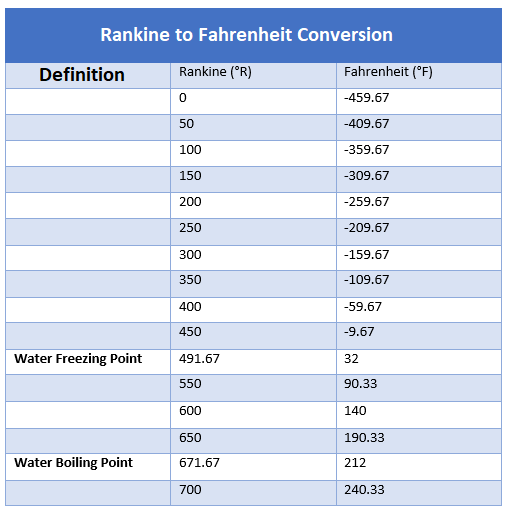 Following table shows the common values used in Rankine to Fahrenheit Converter. Rankine temperature is termed as the absolute scale of thermodynamic temperature and is denoted by ºR. Many engineering systems involving heat commutations widely use this scale for the temperature measurements. This temperature scale is named after William John Macquorn Rankine who introduced it in 1859. The zero Fahrenheit is equal to 459.67 in the Rankine scale. These values increment gradually with the same factor no matter what value in Fahrenheit you aim to achieve. The water freezes at 491.67 ºR and 32 ºF and boils at 212 ºF or 671.64 ºR. It is important to note that Fahrenheit and Rankine’s scale don’t share a common point and 0 ºR is equal to -459.67 ºF. Nevertheless, once these values are reserved for these scales, both increment with one degree on the scale i.e. 1 ºR will be equal to -458.67 ºF. Fahrenheit is termed as a temperature at which water freezes at 32 ºF and boils at 212 ºF, pointing out that boiling and freezing point values are equally separated by 180 points. All these values in Rankine and Fahrenheit scales are calculated and measured at sea level with standard atmospheric pressure. Fahrenheit is named after German physicist Daniel Gabriel Fahrenheit. He proposed this scale in 1724 based on the experiment on the ice-salt mixture. After a successful attempt, he concluded that water freezing point is 30 ºF, while the normal body temperature was around 90 ºF. With the passage of time, as he performed further experiments, he added that previous values reserved for the freezing point of water and normal body temperatures were not the correct ones. Later on, these values were adjusted, terming 32 ºF as the freezing point of water and 98 ºF as the normal body temperature. Fahrenheit temperature scale has long been used as a fixed reference for a thermometer. That’s all for today. I hope you have got something valuable out of this quick read. If you are unsure or have any question, you can approach me in the comment section below. I’d love to help you the best way I can. You are most welcome to keep us updated with your valuable feedback and suggestions, so we keep improving our content and you keep coming visiting us every now and then. Thanks for reading the article.